WideOrbit Video, Mobile, Banner advertising network details. Founded in 1999, WideOrbit is one of the most experienced advertising solution providers in the industry. The company spends more than 35 million dollars per year on developing its products and hiring top-notch professionals in order to provide its customers with the best solutions and services. WO Traffic is WideOrbit's core solution and was launched in the same year of its establishment. It streamlines workflow in radio, cable, and TV for customers. 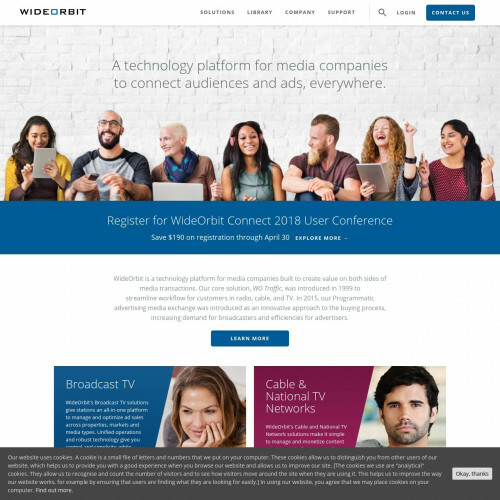 Recently, WideOrbit's new programme - Programmatic advertising media exchange was introduced in 2015 to approach the buying process, and increase demand for broadcasters and effectiveness for advertisers. With the mission of making it easier to buy and sell advertising, WideOrbit understands the challenges in the field and knows how to utilize technology to help. You can check WideOrbit reviews on Affbank and ask WideOrbit Team any question by using the contacts above, especially about how to earn money!